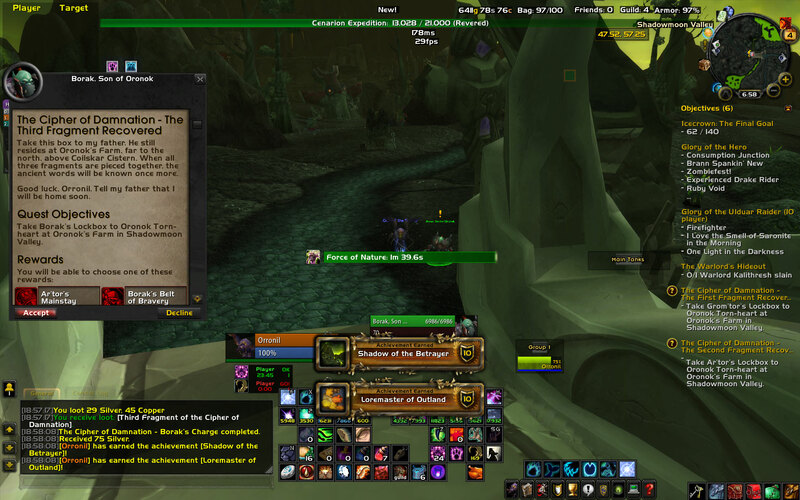 This entry was posted in Uncategorized and tagged achievements, Cataclysm, Goals, mounts, reputation by admin. Bookmark the permalink. No way in *HELL* am I doing loremaster. Far too many quests left on far too many toons for me to even want to consider doing that. The “Burning Crusader” achievement was one of the big ones I wanted to finish before Cataclysm.. I might work on things some Timbermaw rep (ugh.. just that thought has me shuddering).. Or maybe some ones that aren’t quite as innocuous. The rest of the BC reps might not be so bad. I’m almost exalted with the Aldor, so I should probably finish that one up. I’m also working on getting the achievements for having a bunch of tabards. I think i’m at 15 now, but don’t quote me on that. A couple of my guildies just recently got Loremaster, and I saw the intense frustration they went through upon closing in on the last few quests and, to be perfectly honest, you can have it. I’m trying to get the mounts too, however I’ve been working on the Winterspring Saber on my Priest since the summer of 06… so I’m not currently optimistic on ever finishing that grind. Good Luck with the Loremaster. Icecrown shouldn’t be too bad, I found Kalimdor to be the hardest bit to do. All that riding around, doing one or two horrible quests in each zone.